Wearing white clothes on the Holi day is no less than a nightmare. One cannot ignore the tune of Holi songs or stay away from the colours. Even if one tries to do so, someone else will paint them! Holi (festival) marks an important day in the Hindu culture, and people of all faiths participate in the festival of colors (Holi) with enthusiasm. It attracts one and all due to the variety of significance it has. Holi festival highlights the victory of good over evil and marks the beginning of Spring season in North India. People rejoice in the moderate temperatures, eating gujias and energizing for life. Bollywood has captured various moods and shades of Holi festival through a large number of songs. They have given many Holi songs over the years, make it a popular theme for Bollywood songs. Recently, many scenes in Hindi songs have adopted Holi scenes too. With balloons, Pichakari, water, fountains, and colours, these songs perfectly fit the Holi celebration. Here is the list of songs on which you can groove and enjoy the festival of colors. The Holi song from the movie Toilet-Ek Prem Katha highlights the tradition of Lathmar Holi. The wives hit their husbands in the playful setting of Holi against their complaints. It is celebrated by the folks of villages in Vrindavan and its adjoining areas. Many tourists gather each year to witness and celebrate Lathmar Holi. Looking out for ways to convey your feelings or express your love this Holi? Balam Pichkari from the movie Yeh Jawaani Hai Deewani will help you. It adheres to all generations and makes the colorful environment pumped up. It is the best Holi song in the list of Holi songs. The song, Lahu Muh Lag Gaya from the movie Goliyon Ki Rasleela Ram Leela, is a sensual, romantic, seductive and private kind of Holi song on the festive playlist. It is ideal to play the Hindi Holi song when couples want to enjoy in public or private! Holi festival is a time to express love. 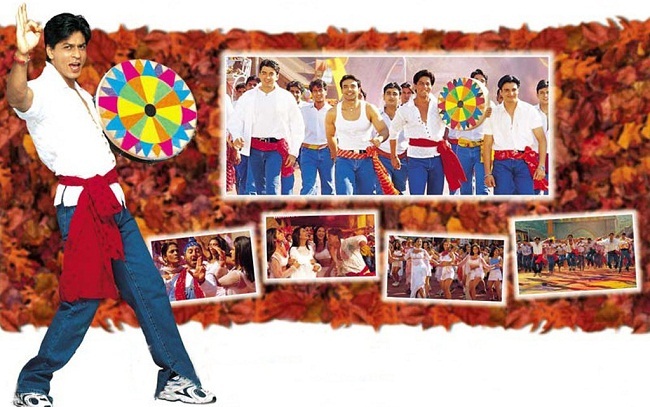 Soni Soni Ankhiyon Wali song from Mohabbatein has been a Holi Anthem for a long time and hence, is one among the popular Holi songs list. The dance moves are easy and almost anyone can copy them. Start practicing them before you play the song this Holi! Sung by Asha Bhosle and Mahendra Kapoor, Arre Ja Re Hat Natkhhat Hindi song is a popular Holi song. It shows the teasing and playing with colours in the traditional setting. Feel the vibrancy of colours with this latest Holi song. The song Bajaa Bajaa Bajaa Dhol Bajaa Re from the movie Mere Pyare Prime Minister is composed by Shankar - Ehsaan - Loy, and penned by Gulzar to add playful tune to the Holi celebration. A beautiful hindi holi song is Mohe Rang Do Laal from the movie Bajirao Mastani. Deepika Padukone in the role of Mastani expresses her love with this song.